Most of the times minute jobs (as we perceive them) like buying plywood and veneer for the furniture of our house is given to the carpenter who is in charge of making the furniture. We blindly trust that person’s recommendations and choices because the fact is we ourselves have the least knowledge in that area. Plus, we really are not in the mind set of going to such places and looking at each option closely and choosing wisely because the retailers would also have their own biased opinions towards their products. To make the process easier and yet get the best plywood sheet for your furniture, we would recommend buying plywood online. By doing these few quality checks you would be assured about the quality of the product. Core gaps :- You should see the plywood from the side profile of the sheets. A few small gaps (2mm-3mm) can be overlooked but if there are more it’s a warning sign that the quality of the plywood is compromised. Overlapping: - The lines of different layers on the side profile of plywood should be running straight. If they overlap each other too much, it’s not good. Nail holding capacity: - You should take a nail hammering test before using the plywood on the side profiles of the plywood. If the layers split on hammering, the bonding of your plywood is weak. Test reports :- Any high quality plywood in India would have gone through factory lab tests and third-party lab tests of their plywood panels. You should ask for these reports from the seller to check how genuine the products are before purchasing them online. Resistance to termites and borers :- A test report should be obtained from the manufacturers of the product to guarantee you the resistance the product has from termites and borers. Generally, the companies skip this step due to the high costs involved. You can also read: Laminate vs Veneer: What is better for your furniture? 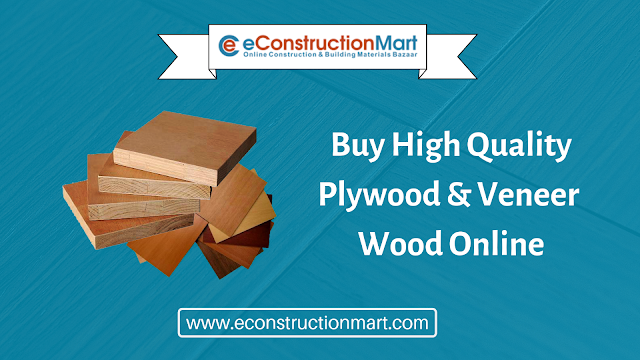 These would be a few basic steps to keep in mind while you buy plywood or veneer wood online. These are the necessary steps you can use in checking any furniture raw material you are planning to order online. It will make the process simple, while you take an independent decision because you have enough knowledge of the product and this will make the furniture last longer than usual.